This product offers a complete power conversion system between batteries and AC power. It can provide backup power, sell power back to the utility grid, or provide complete stand-alone off-grid service. 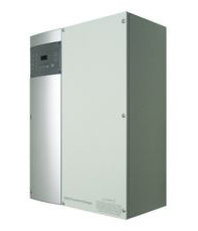 The Xantrex XW Inverter/Charger is a modular building block sine-wave inverter/charger that can be used for both residential and commercial stand-alone, grid-backup, and grid-tie applications with battery energy storage. 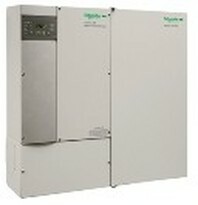 The Xantrex XW Series Inverter/Charger is a self-contained DC to AC inverter, battery charger, and AC transfer switch. Up to four inverters can be installed in parallel to create larger 120-240 volt, 3-wire, single-phase systems allowing for increased capacity. The XW’s dual AC inputs make it simple for dealers to use with generators in hybrid grid-tie, or with generator/micro hydro or dual genset applications. A Battery Temperature Sensor (part number 808-0232-02) is also included with the Xantrex XW Inverter/Charger. The Battery Temperature Sensor monitors the temperature of the battery bank and adjusts the charging accordingly. The XW+ 5548 NA Inverter/Charger cannot connect directly to photovoltaic arrays, wind turbines, or other renewable sources. The batteries are the inverter’s primary source of power. However, if these sources are used to charge the batteries, the inverter can use their energy by drawing it from the batteries. The renewable source is always treated as a battery charger, even if all of its power is used immediately. The renewable source must have a charge controller or some way to prevent overcharging. Xantrex XW60-150 MPPT charge controller can be used for this purpose, as can other products. Xantrex expects the system designer to use the XW Charge Controller with their inverters. Their sizing tools assume the XW Charge Controller. Most importantly, Xantrex handles the Ground Fault Protection (required by National Electric Code 2008 in all systems) in the charge controller. If you do not use the Xantrex XW Charge Controller then the GFP must be handled in a different way. + FREE FREIGHT SHIPPING within LOWER 48 states!